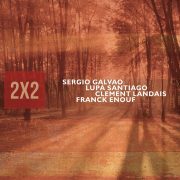 2×2 is a group formed by 2 Brazilian musicians (Sergio Galvao sax and Lupa Santiago guitar) and 2 French musicians (Clement Landais bass and Franck Enouf on drums), it was recorded in two days during May 2017 in Rouen, Normandy/ France. The Brazilians first met when Sergio Galvao invited Lupa Santiago to join his band for a tour he was going to make in 2014. They both knew each others music works and the musical identification and friendship happened very fast. After the second tour they decided to form a new group and record an album, but Sergio moved to France. There he met Clement and Franck, two amazing French musicians whom he made many concerts as trio, under the name:Three is Enough, they share compositions and decided to record together. By coincidence Lupa was making a tour in Europe with another group in the same period of the year and the idea to join the trio’s recording came to everybody’s mind. So the 4tet met in the studio on the first day of recording, all of them brought their compositions and after many jokes concerning soccer the name for the cd came very easy : 2×2.